Dubai is an amazing city and in our opinion certainly worth being on your bucket list. We always enjoy the culture, hospitality, amazing food, and the excitement of the ever-changing city. 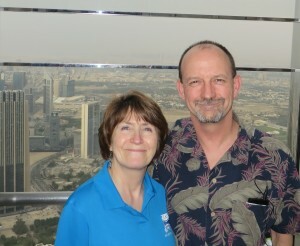 On a recent trip, we even carved out some time for exploring and visited the world’s tallest building, the Burj Khalifa. 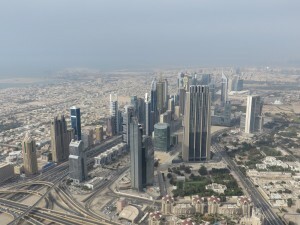 The view from the observation deck on the 124th floor, aptly named At the Top, is extraordinary. The flight from Atlanta to Dubai was 14 hours. Long flights are a great opportunity for couples to become independent travelers. Look around a plane on your next long-haul flight and see how disengaged couples become. One person will be watching a video and the other napping. Scan to another couple, where one person is playing Sudoku and the other reading their e-book reader. Clearly they are not engaged. So, the question becomes: How can you stay engaged on long flights? Scan to us and almost certainly we will be watching the same movie, in sync, on different in-seat monitors. To be clear, we do not think there is anything wrong necessarily with couples doing their own thing on a plane. We just think it is a great chance to engage in an activity together. The sequence is always the same and starts with a conversation about what movies are available — remember, conversation is always good. Next, independently, we each scan through the movies trying to find one that will be of interest to both of us. We certainly do not have the same tastes in movies. There are some that JoAnn likes and some that John likes. The trick is to find that subset of movies that both of us like. This is actually very good for our relationship, as we continue to think about the other’s interests. After our independent review, we have a discussion about what each of us is thinking (again, talking is good). Often we will have each found a few likely candidates, so we develop an informal priority list. To be honest, we usually take turns choosing a title from the subset. Next comes the really fun part, as we work with the worn remotes to get the movies to start at the same time: Ready? 3-2-1, play. It is even more fun when it is time for dinner or a stretch break and we go through a similar routine to pause at the same point. Sounds a little silly, but it is great fun…make sure to try it. This tip is one of the many included in our book, Tips for Two: Tales of a Globetrotting Couple (www.tipsfortwo.com). Tips for Two includes a series of helpful hints that we found incredibly useful. Some were designed to make our travel safer, while others focus on our comfort. Some help us learn, another group ensures we are respectful, and still others help us keep our costs manageable. More importantly, though, all of them help us enjoy each other. Remember, these tips are about making travel as a couple as enjoyable as it can possibly be! This post was also published on Kiss from the World.